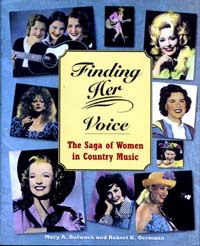 Legendary country music stars such as Dolly Parton, Lorettea Lynn, and Tanya Tucker, who have commanded the airwaves for decades, have a rich legacy that comes alive in "Finding Her Voice: The Saga of Women in Country Music". From its very beginnings, country music has been the rare outlet that American women have used to express their spirited rebellion, poignant setbacks, and unassiable hope. "Finding Her Voice" documents the lives of the hundreds of womenfrom country's biggest legends to its forgotten pioneerswho have nurtured the rise of country music since the mid-eighteenth century. Included are women like Sara and Maybelle Carter, regarded as country's founding mothers; Kitty Wells, the breakthrough female stylist in the rough honky-tonk era; Patsy Cline, a haunting figure whose life and tragic death continue to fascinate millions; as well as Wynonna Judd, k.d. lang, and Mary-Chapin Carpentercountry's newest generation of performers. Moreover, "Finding Her Voice" graphically details that female country musicians have faced the same poverty, hardship, sexual subjugation, and exploitation borne by working-class women across America. Fully illustrated with more than two hundred black-and-white photographsmany rare and previously unpublished"Finding Her Voice" captures, in vivd words and pictures, the feisty and determined women who continue to create country's enduring, vibrant musical tradition. Robert K. Oermann is a multi-media music journalist whose work appears regularly in "The Tennessean", on WSM radio, and on The Nashville Network cable television channel. He has won the Media Achievement Award from the Country Music Association.